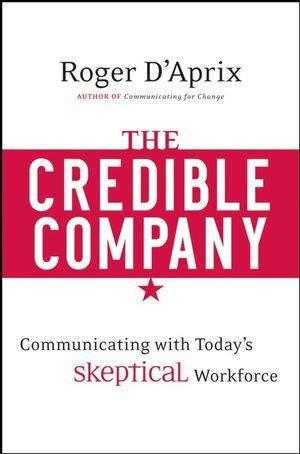 In The Credible Company, communication expert Roger D?Aprix provides a logical and tested strategy to inform skeptical employees in a time of turbulent change. With information being the lifeblood of today?s intellectual-capital assembly line, D?Aprix explains, the internal communication task has taken on an unprecedented importance. Drawing on his experience as a corporate communication executive and consultant, the author offers a practical prescription for effective communication: INFORMS (as in a communication strategy that informs). Based on the principles of Information, Needs on the Job, Face-to-Face Communication, Openness, Research, Marketplace, and Strategy, INFORMS provides a winning formula for those with the insight and motivation to work for greater credibility within companies and other institutional organizations. Throughout the book, D?Aprix provides numerous illustrative examples from his rich consulting experience as lessons in what to do and what not to do in communicating with the workforce. Roger D'Aprix is vice president and advisory board member of ROI Communication. He is an internationally known communication consultant, lecturer, and author who has assisted scores of Fortune 500 companies in developing their communication strategies and redesigning their communication training. He is the author of several business books including the best-selling Communicating for Change: Connecting the Workplace with the Marketplace from Jossey-Bass. Preface: Why This Book is Important. Prologue: From Entitlement to Capital Asset. 3. Needs on the Job. Epilogue: A Profession at a Crossroads.